Everyone has a Salesforce story. From accidental admin, power user turned powerhouse, admin to consultant, dev to CEO, Salesforce career paths are as diverse as the stories that make them, and make us. Two years into university I realized I didn’t want to be an electrical engineer. But I didn’t know much else. I found work in a call centre to keep me stocked in ramen and Kraft Dinner. While I worked in these rigid call centre systems, I fantasized about adding fields and data points to better filter and segment my lists to improve my own success. Then one day, a coworker on the technical side of the business - the one and only Nik Panter, gave me a quick tour of Salesforce. Red-S Salesforce. I was blown away. I was in love. With Salesforce, not Nik… though, he would eventually have a role to play in my #SalesforceLoveStory. Over time I found myself spending evenings working through the old partner portal training modules. I’d be playing in a dev org, building a data model and dashboard to better analyze my iTunes library and play counts, or setting up Service Cloud with entitlements and milestones and service consoles and email to case, just revelling in the awesome. I spent as much time as I could on the answers board, trying to answer questions, building out the issues and potential fixes. I don’t think I actually got many answers in, as other pros would have it solved long before I did, but going through those motions was invaluable practice. Ultimately got my admin certification, and Nik took me under his wing and brought me into a contract/part-time consulting role. I was working on a Service Cloud implementation in all the free time I could muster, and slicing meat at a local deli for minimum wage to try to keep currency flowing in. It was an incredibly difficult stretch, but I can still remember that feeling of when I was offered a full time consulting position, officially a full time Salesforce guy. Just elation. Fast forward through 5 years of consulting experience and the ups and downs and lessons learned, after a particularly grueling quarter-long project that had me travelling 90%, I was talking to Nik yet again about a new role at a new practice that specialized in nonprofit implementations. When I joined the org, my first official day was that team’s all-staff meeting in San Francisco, the day before Dreamforce. We had no idea how we’d make it work. We just met, and were coworkers, me in Ottawa, her in Florida. But we decided to take it one day at a time. 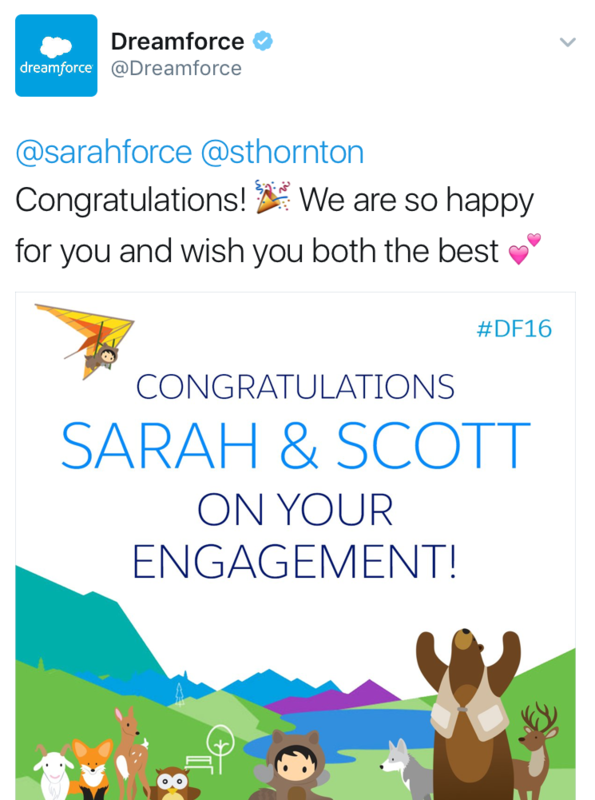 Two Dreamforce-iversaries later, we got engaged at Dreamforce. Getting married at Dreamforce just wouldn’t have made sense with all the hotels booked for all our out of town/country family… but we’re overdue for a Dreamforce honeymoon! We had actually planned to honeymoon at/after Dreamforce, but baby Leia had other ideas for us that year. I don’t think I’d have ever imagined being here when I first saw that red S, but here we are, planning a Dreamin’ event in our own backyard. Everyone has a Salesforce story. What’s yours? Tell us.